Scrapbooking ideas do not need to be complicated or time-consuming. By employing a couple of basic techniques, understanding how to create balance on a page and allowing your photos (rather than a large array of embellishments) to tell your story, it is possible to create captivating pages, such as the one below, in small amounts of time. Give it a go! You’ll soon be ploughing through those piles of photos in the ‘To Do’ list! This layout was created using Junkitz Cat Floral paper, Autumn Leaves Fresh Citrus Flowers Paper, Autumn Leaves Yellow Stripes paper, orange cardstock, Creative Imaginations Leaf Alphabet epoxy stickers, small green alphabet stickers and Provo Craft 3D Flower Frenzy Epoxy stickers. 1. Use the Junkitz Cat Floral paper as your background. 2. Cut a piece of Autumn Leaves Fresh Citrus Flowers Paper measuring approximately 9.5cm by 21cm. Adhere vertically to your background approximately 8cm from the left edge of your page and 1.2cm from the top. 3. 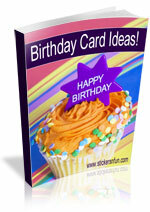 Mat a 5×7 photo with orange cardstock. Adhere to your page approximately 3cm from the left edge and 2.5cm from the top. 4. Mat a 4×6 photo with orange cardstock. Adhere to your page approximately 3cm from the right edge and 5cm from the bottom so that it overlaps with your 5×7 photo. 5. Cut a strip of Autumn Leaves Yellow Stripes paper approximately 1.5cm thick. Adhere across the bottom of your page approximately 1.5cm above the bottom edge. Place three round epoxy stickers on top of the strip in the bottom left corner of your page, as shown above. 6. Use Creative Imaginations Leaf Alphabet epoxy stickers to place the first word of your title directly below the 5×7 photo. Stick small green alphabet stickers underneath your first word to complete your title. 7. Place two rectangular epoxy stickers horizontally in the top right corner of your page, as shown above. 7. Finish off your page by place three square epoxy stickers around your photos, as shown in the layout above. What do you think? 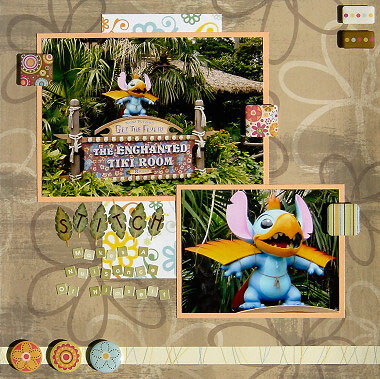 Do you like this scrapbooking idea? Do you have any questions? Would you have done anything different? We’d love to hear from you! Please leave a comment below. This entry was posted on Tuesday, March 18th, 2008 at 8:23 pm	and is filed under Disney, Quick Scrapbooking Ideas. You can follow any responses to this entry through the RSS 2.0 feed. You can leave a response, or trackback from your own site.